Why do workmen insist on starting early when they want to get more stuff done, rather than working late? Who knows. My life is upheaved at the moment as I’m without kitchen (technically I have a kitchen, it’s just all in boxes) but the workmen seem to know what their doing and they assure me that I’ll have a functional (but not finished) kitchen by tomorrow night. If they can start work at 6:30am in the morning tomorrow. Oh well, at least they’re keen. I’m staying out of the flat as much as possible, because the general half-finishedness of it all makes me twitchy. That means that you’ll have to wait a bit longer for the Copenhagen post. Urk, no posts for a fortnight, that’s longer than I intended. My latest trip was the weekend before last, I was in Copenhagen and Amsterdam. I liked both cities, although Copenhagen is too quiet and sleepy for my tastes and Amsterdam was somewhat spoiled by the presence of roving stag parties (almost exclusively pissed and British). There were some nice places in Amsterdam and hopefully I’ll be able to find some more of them when I return in July. I was slightly unsettled by things all weekend, in Copenhagen I was unsettled by finding what looked like a fairly fresh trail of blood drops on my way back to the hotel and in Amsterdam I was unsettled by a drug-pusher suggesting (politely but firmly) that I stop taking pictures of Dam Square — I guess having tourists hanging around taking photos is bad for their business. For those that don’t know Amsterdam that’s roughly equivalent to a bunch of neds coming up and telling you to stop taking pictures of Edinburgh Castle from Princes St. It’s a little bizarre. Piling on the uneasiness was the e-mail I got at work just before leaving, it was announcing the a visit by the president of our division. No-one had any idea he was coming and over the weekend I couldn’t shake the idea that it was going to be ‘bad news’. In the end I had to check my work e-mail while on holiday, something I normally refuse to do, and found a follow-up “Nothing to worry about” e-mail, prompted by a flood of concerned inquiries. In the end it he was just in the area and decided to swing by, unaware of the ripples of panic (and desk tiding) he was causing. Well that’s all over now, buts there’s plenty more things to be concerned about. There’s still eighteen countries left to visit over the next 8 months, which is bang on schedule but still a daunting target. I’ll have to spend some time on another multi-country tour to clear some off the list. Just to add on the pressure I’ve decided to ignore the bathroom fiasco of last year and go ahead and have a new kitchen fitted next week. Eeek. Hopefully there’ll be a few more posts to the next week or so if everything else stays under control. Posted in Life, Travel | Comments Off on Fear. Uncertainty. Doubt. For those of you just joining us I’m trying to visit all 27 EU countries in 2008. We’re about a quarter of the way through the year so time for a progress update. There’s a selection of pictures on my Flickr stream and I’m caught up with all the posts. Hopefully you’ve found some of it interesting. Plenty more to go of course, is it still possible? I’m fairly confident it is, but it’s looking pretty tight on the number of days holiday I’ve got to play with. I’ve had to reel in some of my more ambitious plans but I still think I can get a decent visit to somewhere in each of the remaining countries. It’s over a quarter of the way through the year, and I’ve visited four new countries and seven countries in total, that’s just under where I should be if I’m covering everything equally. I just have to keep on plugging away. Countries I’ve visited pre-2008 are in grey, countries visited in 2008 are linked to their posts. In 2007 I visited 8 other countries, taking 18 flights (2 long haul), travelling around 35,750 km (33,000km by plane). In 2008 I’ve visited 7 other countries, taking 4 flights (all short haul), travelling around 6,200km (3,400km by plane). From Bruges to Brussels on the train takes around an hour, but the difference between the two places is vast. Brussels is much more a typical European city, full of modern buildings and with flocks of people milling around. I didn’t get a good look at the central market square as it was filled with a massive tent holding a stage and seating for some event or other. 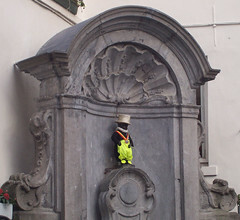 So I wandered in search of the Mannequin Pis, it’s not a big statue and I might have missed it had it not been surrounded by a bunch of tourists, a brass band and a group of people in black-face make-up wielding oversize items of cutlery. I wish I knew exactly what was going on but sadly I remain mystified. After that I managed to get hopelessly lost, the map the hotel gave me wasn’t very helpful and, worse, it didn’t match either the map in my book or reality. I did manage to find another Notre Dame to visit (one of the best I’ve seen). After finally working where I was I headed to a restaurant that I’d seen recommended on Wikitravel. It was booked out save for one table that I could have as long I was done in time for a later booking. I figured this was a good sign and immediately opted for two traditional dishes, eels in green sauce and saddle of rabbit. Both dishes were fantastic, the eels tasted very faintly fishy but with a lot fewer bones than I’d expected, I’m less convinced about the sauce which was just too herby for my taste. The rabbit came with it’s nice crispy skin but both the skin and the flesh didn’t have any real strong flavour, I’d expected something much gamier. I can see why the have the sauce over it to give the dish some oomph. The chips were excellent, they love their chips in Belgium and they’re good everywhere but these were simply the best chips I can remember eating anywhere. The second day I travelled to the Atomium which is outside of the centre of Brussels (although it’s easy to get by train or tram.) 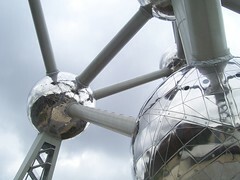 The Atomium is a giant representation of a iron atom, built in 1958 for the Brussles World Fair, it was renovated recently and reopened last year. It’s excellent, just seeing this bizarre building makes the trip worthwhile but you can also go to the top sphere and get great views of Brussels. From the top of the Atomium I spotted another attraction I’d wanted to visit, the mini-EU. I hadn’t known they were right beside each other so it was a nice surprise. The mini-EU is a set of scale models of buildings and locations from around the EU, there’s little sounds clips and some of the models move too. It’s pretty great actually, you learn a lot of things about the countries and because all the models are to the same scale you can get an idea of the comparative size of things. It’s totally worth a day out of the town centre to visit these the area, there are a few other things around to visit, shockingly none of this was covered in my guidebook so you’ll might be better turning to the internet for help. 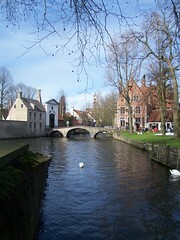 I did manage some pub crawling whilst I was there and whilst I liked Bruges better I did find a couple of nice places. Delirium is stuck down a side street, it’s massive and has a huge range of beers while it’s sister bar across the street is stocked with an equivalent selection of spirits. Well worth searching out, although it’ll be busy. I also found a nice little rock bar which is a nice break from the beer halls and the tourist traps. To be honest I don’t see much reason to go back to Brussels, there’s plenty of more interesting places to visit in Belgium. I’m going to split the Belgium posts to cover each city I visited. 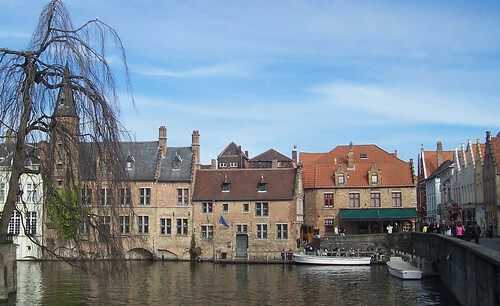 First Bruges, I took the ferry from Rosyth which drops you at Zeebrugge, from there it’s a short bus ride into town. The bus leaves you by the main train station but it’s only a ten minute walk to the centre. The first things that strikes you about Bruges is just the whole picture postcard perfectness of the city, canals, narrow cobbled streets, open squares and some of the oldest buildings in Europe. The second thing that hits you is the smell, the place smells of chocolate and general deliciousness. It’s another small city, all the main sites are within easy walking distance but there’s a few buses if you want to take it easy. The best thing to do is take a canal tour, not only will you get an idea of the layout of the city but you can see things that aren’t accessible from the streets. There are tons of places offering the boat rides, so it’s easy enough to find one. I spent most of my time just wandering around being entranced by the scenery, although I did have to retire for an afternoon nap to recover from the boat trip. I’m surprised the place isn’t filled with tourists although I expect it will be during the summer. 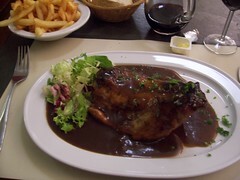 There are a lot of bars and restaurants that are geared up for tourists and, to be honest, the food isn’t that great. 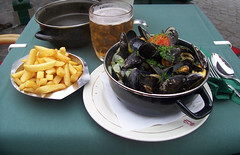 The traditional mussels and chips tasted exactly like you’d expect it to, although the desserts were superb. I imagine that getting further away from the centre might reveal better food but all the places I found further afield were full, perhaps wise to do your research and book in advance. I do my research, however, when it comes to beer and after a brief dinner I’d planned a little pub crawl and an early night. My first stop was to be “‘t Brugs Beertje“, an excellent little pub, full of a ton of beers and a variety of locals and tourists. An absolute must if you’re in the city, I’d like to reel off a list of other pubs to visit but I must confess I didn’t make it out of the first one. Between chatting at the bar and sampling the beers I ended up leaving around one in the morning. I’d certainly go back to Bruges, even if only to go back to that bar. They do a snow and ice festival in the winter and I might try to get to that next year. You are currently browsing the UnorthodoxY weblog archives for April, 2008.